Confusingly, you won’t find a setting called “Glass” anywhere in Vista. You can improve the speed of your computer by disabling the Glass feature in Windows Vista. Microsoft spent a fortune tying Vista and Aero Glass together in the minds and pocketbooks of computer consumers. In fact, a large percentage of all Vista Home Basic users upgraded to Home Premium because they wanted to get Aero Glass. What the ads don’t tell you is that running Aero and Glass on your computer can bog the system down. You can make your computer run faster by cutting out the glitter and fluff, and the speed-up can be considerable if you have a less-capable video card. Right-click an empty spot on the desktop and choose Personalize. 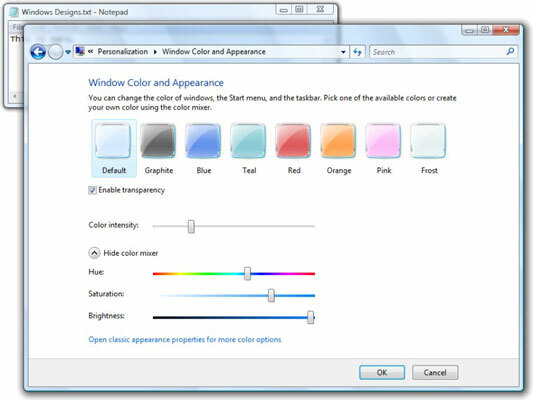 Then click the Window Color and Appearance link. If Aero is running, you get the Window Color and Appearance dialog box. 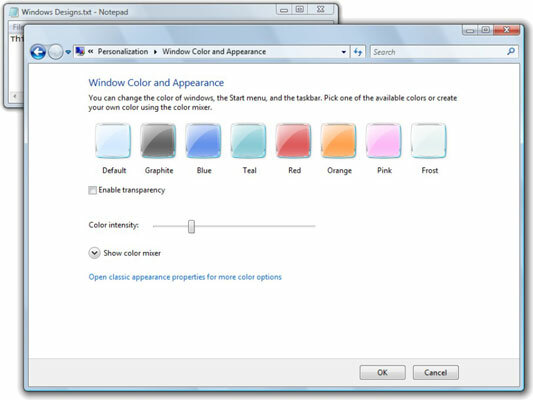 If you see the Appearance Properties dialog box instead, click the Window Color and Appearance link. Uncheck the box marked Enable Transparency. You can see the Glass effect only if you’re running the Aero shell. If you switch to any other shell, such as Windows Vista Basic or Windows Standard, Glass doesn’t exist: Borders around windows are opaque, and there’s nothing you can do about it. Click OK and then “X” out of the Personalize Appearance and Sounds dialog box. To bring Glass back, repeat the procedure, and in Step 2, check the Enable Transparency box.